How to Fly the Consolidated B-24 Liberator video covers the B-24 Liberator bomber of World War II. Included are four B-24 films and the B-24 pilot's manual. Film #1 - Preflight Inspection of the B-24. Told from the ground crew's perspective, Crew Chief Kelly & the boys do the check in this inside & out point-by-point inspection of the big Liberator. In B+W with a run time of about 30 minutes. Film #2 - Flying the B-24D. The most detailed systems & flight procedures checkouts for the B-24 pilot you will ever see. The B-24 was technologically more advanced than the B-17, but due to the rush into production there were some early teething problems. Nevertheless, Liberator squadrons flew many outstanding missions, including the epic low level raid on the Romanian oil fields at Ploesti, and crew members were proud of their ship. In B+W with a run time of about 58 minutes. Film #3 - B-24s Get Back!. A remarkable film that shows how B-24s overcame incredible battle damage to bring their crews home. Numerous examples of seemingly critically damaged B-24s making it back. This is a fascinating instructional training film with specific techniques to bring your badly crippled ship down safely. Some great B-24 combat footage too. In B+W with a run time of about 17 minutes. Film #4 - Medal of Honor: Ploesti August 1, 1943. 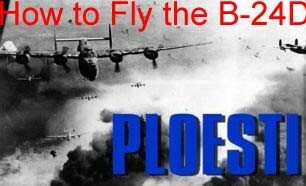 On August 1, 1943, specially trained elements of the 8th and 9th Air Forces flying B-24 Liberators based in Benghazi, Libya launched a daring low level attack on Ploesti, over 1,200 miles away. They struck and struck hard, but the cost was very high. Unescorted by fighters and coming in literally at tree top level to surprise the enemy, 54 out of 162 of the attacking bombers were lost, along with 540 American air crew. Every member of the attacking force was awarded a medal, including 5 Medals of Honor, the highest decoration awarded by the U. S. military. Of the Medal of Honor recipients, only Col. Leon Johnson, 44th Bomb Group, and Col. Jon Killer Kane, 98th Bomb Group, survived the mission. This film features dramatic action that has been excerpted for countless documentaries. This is the original. In B+W with a run time of about 7 minutes. A 145-page B-24 pilot's manual is included on the DVD. It is in .pdf file format with detailed photos, systems diagrams, performance charts, procedures & more. The manual can be accessed on a computer equipped with a DVD drive. The B-24 dvd is in NTSC format and region-free. This B-24 video has a total run time of about 112 minutes and is packaged in a plain clear plastic C-Shell DVD case without paper graphics.